Manage to Cheat the Slots Machine! From the very beginning it's important to say that it's impossible! There were so many tries to do this, that the slots manufacturer know, having learned that bitter lessons, now know how to control the slots machine security and how to catch the desperate thieves. Everybody wants to have freebies, but we have to remember that everything isn't got simply, some time we'll have to pay for it, so it's not worth trying even to start such deals. Cheating and gambling are the words that really come near. But don't be concentrated in this, just get it straight! Don't be misled by the myths that it's possible and you have to do this or that in order to have your free payout. Only the manufacturer of the slots game programs can guess how to do this, but not always they can come to it, and almost never they use this. Oh, in the past it was quite possible to do this, even if you are not the software programmer of the slot machine. Ok, in past in general there were not such persons. Even the most ordinary persons managed to throw the fake coins into the machine and that's it, they could play to his heart's content. Such state had Fey Liberty Bell, but for the time being. 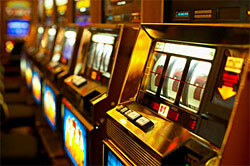 Then it was developed, innovated and everybody forgot about such unpleasant experience in the slot machines work. Tommy Glenn Carmichael is considered to be the main cheater in the world of slots gambling. Yeah, he managed to outwit the machine with his device invention of "Monkey's Paw" and "Top-bottom joint". Imagine, just simple coat hangers helped him in this! They just were shaving a little bit the coins and lighten their weights. So, you could play slot machines with one coin everlastingly. But as always happens the genius was caught and spent more time of his life in prison, but really obsessing with the generous task how to help the manufacturers in catching the gambling crimes. Mini lights: Imagine that just directing the light into the slot machine can give you the result of good payouts! The light sensors just simply were straying the slot machine, and it couldn't recognize the amount of coins thrown. Slugging: there is also the way of cheating with counterfeit coins. This term even has led to the other one - sluggers, but now they rarely can find not advanced machines with slighter way of protection. Grapping the jackpot: someone is on the way to have a payoff of the jackpot, but the swindlers are creeping unnoticed and require from the casino to make the payment showing at the machine which shows the symbols of happiness. Stranger situations, but it happened in reality. To cut the long story short it must be admitted that nowadays the casino management is really so advanced that only the professionals and even more the programmer specialists can manage to outwit the strong and invincible mechanism of slot machines. Just remember that there is a limit to what you can do!